If you eat tomatoes one way this summer, LET IT BE THIS WAY. Oh my gosh oh my gosh oh my gosh. That is all I have to say. 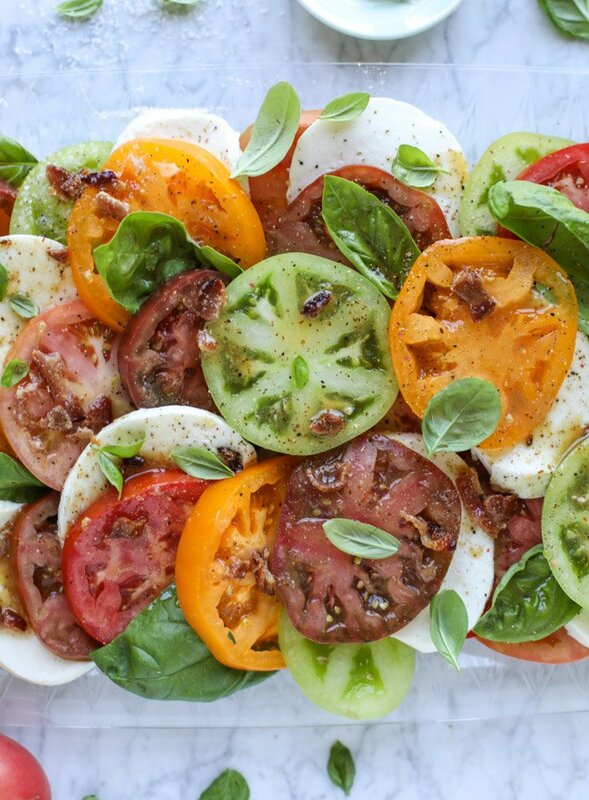 Aside from “this is a caprese salad with heirloom tomatoes and HOT BACON DRESSING.” Whaaaaat. I am noooo stranger to a hot bacon dressing. I made a spinach salad with it years ago for the blog, because it is one of my mom’s (and was one of Mother Lovett’s) favorite things, if not her absolute favorite dressing. She has talked about it since I was a kid and anytime it’s on the menu, it’s ordered. Just a few months ago, I made an asparagus potato salad with the hot bacon dressing because it’s SO good. It’s smoky but also sweet. The flavor is incredible and it’s more of a vinaigrette that a creamy dressing – and vinaigrettes are my all-time faves. 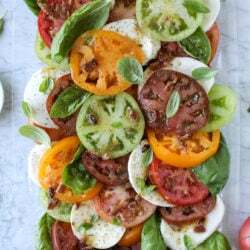 So when I stumbled upon a bacon caprese salad, I just about died. No, really, I was stunned. Jaw-dropped. I could NOT believe it and was like how on earth did I not think about this? I mean, a BLT is one of my favorite flavor combinations. The smoky, crunchy bacon with juicy tomatoes is just too good. So the idea of putting that dressing all over perfectly ripe tomatoes AND adding cheese? Yes yes yes I knooooow I’ve been quite overzealous with my use of tomatoes this season, but how can I help it? This is completely different from any other tomato recipe I’ve shared and hi, we all need it in our lives. Stat. Ew. I hate that word. This plate barely needs an explanation. Fresh tomatoes. Crunchy fried bacon, but crumbled and turned into hot bacon dressing. Fresh, fragrant basil. Fresh mozzarella! More cheese please forever and ever. The flavor is insane. It’s still a salad, so it’s, uh, good for us. It’s the quintessential summer dish. You can make it for a dinner party or for yourself and it’s equally impressive and amazing. Everyone will love you for it… especially yourself. You will love you for it. Get it, get it! 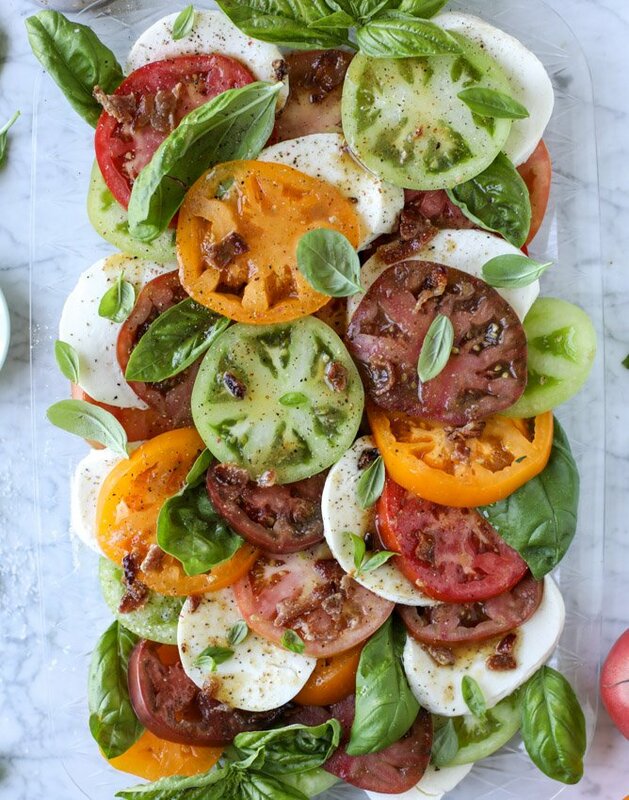 Layer the tomatoes, mozzarella slices and fresh basil on a plate or platter however you would like. Season with the salt and the pepper. Drizzle with the hot bacon dressing serve immediately. I could eat that plate single everyday. OMG MIND = BLOWN. i would have NEVER thought to pair hot bacon dressing with anything but tomatoes. this is PERFECT…chris is going to die. This is the best spin on tomatoes I’ve seen all year! This looks so summery and refreshing! I want this for lunch today! I can’t get enough caprese anything this summer! Our herb garden has flourished, and i have been taking FULL advantage of the basil bush. but now the bush is bare because i tried to make pesto on Monday and it tasted like dirt shake. because somehow after over a decade and a gallons of pesto made, I have forgotten how. hahaha oh my gosh… i can’t even imagine. Just made this as part of our dinner and I can’t stop eating it! There isn’t going to be any for my husband! Crying good tears over this. Oh my god it’s beautiful. hey girl- this looks so divine! yummy for my tummy! Gorgeous! A MUST try. Love the heirloom colors. haha i am glad you got to enjoy their leftovers!